I aim to be optimistic and always provide a genuinely encouraging portrayal of travel and life on the road but right now it feels downright dull and aggravating. Aggravating because of the combination of a plethora of options and my indecision paralysis are slowly driving me nuts. I know I don’t really have anything to complain about and I know my life is damn good; I’m blessed beyond measure to be able to travel footloose and fancy free–but I shall whine a bit regardless… Without the urgency of a compressed timeline (e.g. vacation, sabbatical) or the restrictions of needing to adhere to a specific itinerary, I find myself feeling listless and uninspired for the first time in months. I’ve been going for the better part of a year and it appears I’ve hit my slump. 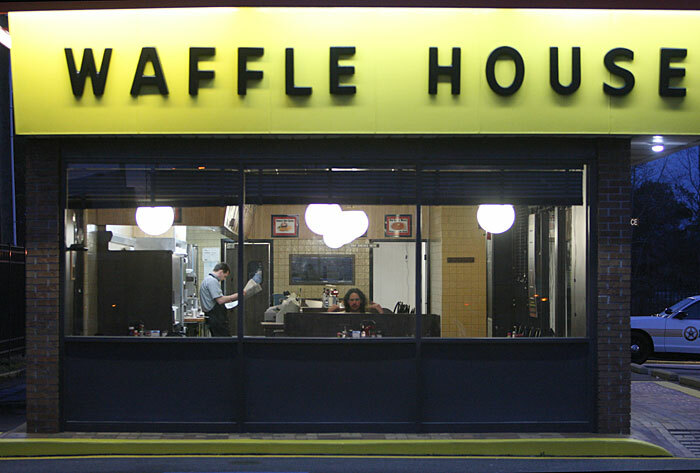 For the record: I adore Waffle House (scattered, covered, smothered). My drive to pack up the backpack and hit the road is on hiatus. The itchy feet that plagued me months ago are feeling heavy and reluctant to put on more miles. The novelty of unfettered travel has lost some of its luster and now I feel like I’m sitting alone on a sticky vinyl booth inside an all-night diner; it’s 1am. The broken fluorescent lights twinkle off the dented silver milk tin next to my bottomless cup-o-joe as an indifferent waitress stares down at me. Though there are no other customers, she is impatient and irritated with me.“What do you want?” I can only stare up at her blankly, utterly impassive and unsure of what to order; incapable of answering this most basic of questions. When I feel slightly less than satisfied, I go into problem-solving mode. This seems a rational response to a situation: If there is a problem then there is a solution. It’s just like math class and I math: there’s always a solution! If I am lacking motivation then x. Solve for X. Think creatively. A) Stay here, extend visa, get a job at a local bar/guesthouse. Kill some time, save some money. Read books, write more. B) Arrange a Vietnam Visa. Make culinary expedition from Ho Chi Minh to Hanoi and meet up with a friend mid-way through the journey. C) Pack in the SE Asia portion of the trip, buy a flight to Australia and earn $20+ dollars an hour for a couple months. What I most want to do is be at sea, surrounded by ocean, crewing aboard a sailboat. This is not a totally unfounded desire, I have some previous sailing experience. Unfortunately, enacting this particular plan depends upon endearing myself to a skipper and apparating myself onto an outward bound vessel. I’ve joined relevant forums, contacted a few skippers and even have a lead with one stunning Norwegian historic vessel that delivers medical and school supplies throughout remote island archipelagos. Yet until plan D aboard a ship is secured, I’m left with time and place to fill. Where to be? What to do? How to spend my time? What do I want? My Cambodian visa expires August 28 so decisions will be made, my hand will be forced. I gave option A a decent try, working a backpackers bar/resto/guesthouse for the better part of a week. Option D seems to be coming along and thank god, because B and C remain lusterless. So it goes. For the meantime, I will occupy myself at the beach a few more days, using the time to take long walks, meditate, do a bit of yoga. Most likely I will move on from here early next week, make my way back to friends and familiar territories of Northern Thailand for two weeks then voyage onward to Indonesia. If I receive good news from the Vega then I will go to Indonesia. Problem-solved. Did you enjoy this musing upon long-term travel and planning? Please add to the conversation with a comment below, Like Live Right Travel Far on Facebook, and be sure to subscribe to receive the latest. Thanks so much! Categories: Adventure, Cambodia, Travel Happens, Uncategorized | Tags: adventure travel, backpacking, Borneo, Buddhism, bus, Cambodia, Chiang Mai, couchsurfing, East Timor, Facebook, friendship, historic vessel, Indonesia, Laos, meditation, New age, NGO, on the road, sail, sailing, SE Asia, SE Asia backpacking, self-discovery, solo travel, solo traveler, solo woman traveler, Thailand, travel, travel blog, travelogue, Vega, woman traveler, woman writer | Permalink. Hope that a ship sails with you on it very soon!